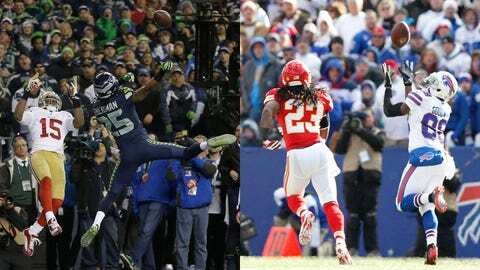 An upgrade from Kendrick Lewis (right) to someone more like Richard Sherman (left) could help the Chiefs immensely. KANSAS CITY, Mo. — Look at them, with their lattes and their Space Needles and their Cobains and the Hendrixes and their Guinness World Records and their Seahawks and their Super Bowls. Pfah! What does Seattle have that the Kansas City Chiefs don’t? "The simple answer," John Castellane says, "is obviously Richard Sherman." "His data, his stuff is pretty incredible." "Balls thrown in his area. Or lack thereof." OK, FINE! WE GET IT! SHUTDOWN CORNER! TAKES AWAY HALF THE FIELD! HE’S THE BEST CORNERBACK IN THE GAME! WHEN YOU TRY HIM WITH A SORRY RECEIVER LIKE CRABTREE, THAT’S THE RESULT YOU ARE GOING TO GET! DON’T YOU OPEN YOUR MOUTH ABOUT THE BEST, OR I’M GOING TO SHUT IT REAL QUICK! Sorry, John. You’re just doing your job. "Across the board, they’re physical," the ProFootballFocus.com analyst continues. "And they’re just good." Don’t get him wrong: Castellane, who tracks the Chiefs for PFF.com, thinks the Andy Gang is good, too. But as the City of Fountains grits its teeth and gets ready for a week of slobbering over Peyton Manning and whining about the weather (it’s Jersey in January; yeah, people, it might snow), Chiefs fans would be wise to take a long, hard look at Seattle’s gifted (and loquacious) cornerback. Not his words. His play. Him. Or rather, what he represents. A brick wall in the back, an absolute ballhawk as the last line of defense. A strategist who plays Jedi mind tricks with opposing receivers and quarterbacks alike. Sherman talks a good game, goes out and plays one, then talks about it again. Pro Bowl running back? Check. Pro Bowl quarterback? Check. Solid line? Check. Mean front seven? Check. The Chiefs can go pretty much head to head with the Seahawks save for perhaps three position groups: receiver; pass-rushing depth (life without Justin Houston and/or Tamba Hali wasn’t pretty); and, most glaringly, in the secondary. To put it another way, Eric Berry can’t do it all by himself. 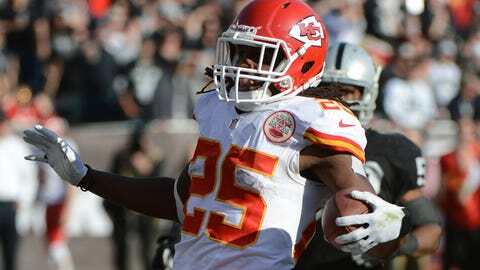 In the 21st-century world of spread offenses, nickel is the new normal, kids, especially in the AFC West: Two safeties, three corners, or some funky combination thereof. Kansas City is sending safety Berry and cornerback/slot-back Brandon Flowers to the Pro Bowl. Seattle placed Sherman and both of its starting safeties, Earl Thomas and Kam Chancellor. The Andy Gang needs one more. One more Sherman. One more Chancellor. One more Thomas. One more something. If you’re going to keep rolling the dice with defensive coordinator Bob Sutton’s blitz-happy, press-man scheme, you’ve got to keep the rushers coming (in other words, depth past Houston and Hali) while protecting yourself in the secondary in one-on-one matchups. Manning was positively surgical, twice over, in isolating Kansas City defenders where he wanted them, when he wanted them. And no amount of liquor will permanently remove the image of Indianapolis’ T.Y. Hilton, running around like some fox squirrel, from the scarred psyche of Chiefs faithful. When matched up against teams with either porous offensive lines or overmatched signal-callers (lookin’ at you, Jacksonville, Tennessee, Cleveland, Buffalo, Oakland), Sutton’s swarm-the-box approach looked to be the work of an inspired genius. But then the good quarterbacks turned up, Houston and Hali got hurt, and those oil landscapes were replaced by finger paintings. According to PFF’s charts, over their first nine games, the Chiefs allowed 11 completions that were thrown for 20 or more yards downfield. In their last seven tilts, they allowed 16 — or more than two per game — and then three more in the AFC wild-card loss at Lucas Oil Stadium. Put Sherman or Thomas on an island, they own the longitude. Put Kendrick Lewis or Dunta Robinson on an island, they might wind up eaten by sharks. "They were so up-and-down," Castellane says. "All of them had his bright spots." But the valleys are the moments that stick, the ones that burn all through the winter months. Brian Billick’s "toxic differential" stat — which adds a team’s turnover differential to its big-play differential — doesn’t lie: The NFL’s top eight in ’13 — Seattle (+66), Philadelphia (+60), San Francisco (+42), Carolina (+25), Denver (+17), Cincinnati (+16), Kansas City (+13) and New Orleans (+12) — all reached the postseason. But the Chiefs were the only club among that top eight with a negative big-play differential (-5). Which means they’ve still got only half of that winning formula absolutely right. The Andy Gang was +15 in rushing big-play differential — number of run plays that went for 10 or more yards for you and against you — which compares favorably with Seattle’s +23. That wasn’t the issue. This was: In terms of passing big-play differential (completions that went for 25 yards or more), Seattle was +23, tops in the NFL. Kansas City: -20. Rock bottom. And before you launch into another diatribe about Alex Smith’s arm strength, the Chiefs were tied for last in the league with Dallas for most opponent big passing plays given up, with 43. One more Sherman. One more Chancellor. One more Thomas. One more something. Buffalo’s Jairus Byrd? San Francisco’s Donte Whitner? Sean Smith, Robinson and Berry are signed through 2015, Flowers and Cooper through 2016. Quintin Demps and Hussain Abdullah, who both excelled in special teams roles, are free agents. So is Lewis, who saved his worst for last and tops just about everyone’s "expendable" list. "Flowers is so versatile, you can move him in and out; Cooper, being a rookie, I’m not sure they’re going to cut bait with him," Castellane says. "There’s going to have to be an upgrade somewhere. It’s not going to be Dunta Robinson." No, it’s not. The simple answer is obviously Richard Sherman. The complicated one is where. And how.